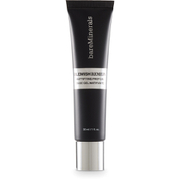 Perfectly prepare your skin with the bareMinerals Blemish Remedy Mattifying Prep Gel, a lightweight formula that instantly mattifies the complexion. The weightless gel is enriched with a blemish-busting blend of Aspen Bark, Tea Tree Oil and peptide complex, which work together to keep the skin clear and healthy. Perfect for keeping oiliness at bay, the prep gel also contains oil-absorbing minerals to keep skin looking fresh and matte all day long. The first step towards a flawless base, bareMinerals Blemish Remedy Mattifying Prep Gel will prep skin for beautifully smooth makeup application. Smooth evenly onto skin after your skincare routine. bareMinerals Blemish Remedy Mattifying Prep Gel 30ml was found on 2 websites and was price compared using EAN: 0098132431038. The cheapest bareMinerals Blemish Remedy Mattifying Prep Gel 30ml is shown as the main item, prices range from £22.00 to £22.00, excluding delivery. Price comparison based on price and delivery charges, with any valid discount codes being applied, is shown in the table above. Prices and information correct at the time of publication.